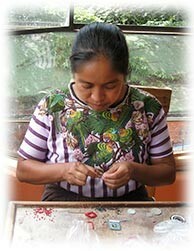 While touring Guatemala, Nancy encountered countless talented artisans weaving, painting and carving. Because of political unrest, the country offered minimal tourism trade and few outlets for selling their beautiful wares. Nancy’s vision was to work with artisans fine tuning designs that would appeal to buyers in the US. She knew that this would create opportunity for many who would otherwise not have it. Since that time, Dunitz has introduced countless beaded collections that have consistently employed well over one hundred women and men. 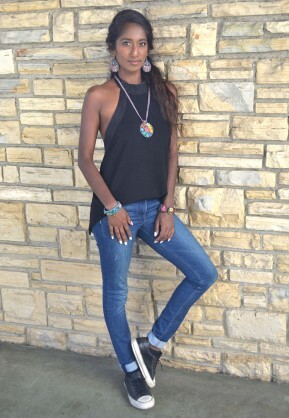 Dunitz & Company’s beaded jewelry is made primarily with Czech and Japanese beads. Our designs often include other elements such as ribbons, leather, vintage buttons, coins and semiprecious stone chips. You’ll often find traditional Guatemalan weaving and embroidery incorporated in our creations. We always follow fashion trends for color inspirations. In 2011, Dunitz & Company introduced the Joanie M collection, named to honor Nancy’s mother. This beautiful fused-glass jewelry line is also handmade in Guatemala. The line was born when Nancy saw tremendous potential in the glass work of a local artisan named Rosa and began collaborating with her. The colorful collection of jewelry they developed has delighted many of our customers and created a sustainable business for Rosa and her staff. Better yet, the Joanie M collection is steadily growing, putting more and more artisans to work. Being based in Hollywood, CA, has its perks. Dunitz & Company designs have been spotted in many television shows and movies. Fashion editorials often include our designs. We’ve been featured in many magazines including Harper’s Bazaar, Redbook, Seventeen and New York. Dunitz & Company supports and contributes to several organizations that help those living in the community where our beadwork is crafted. "Pueblo a Pueblo," a community-based charity, funds many grass-root projects including child education and lunch programs as well as mother-infant care. 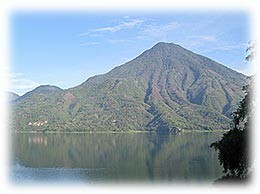 “Hospitalito Atitlan” is the only hospital that cares for those living in the community where our beadwork is made. "Puerta Abierta" is a free library that also offers reading classes. Dunitz & Company is a member of the Fair Trade Federation and Museum Store Association, a Gold Certified Business member of Green America and a founding member of Fair Trade Los Angeles.